La Crosse Engineering & Surveying is a professional land surveying and engineering services company serving the needs of the 7 rivers region. We are certified to conduct land surveys in both Wisconsin and Minnesota, and serve La Crosse, Monroe, Vernon, Trempealeau, Houston, and Winona counties. La Crosse Engineering uses the latest field equipment and surveying software to ensure that the client has quality results as we have done so for the past 38 years. 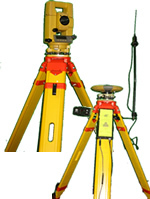 Feel free to contact us about any of your surveying needs.